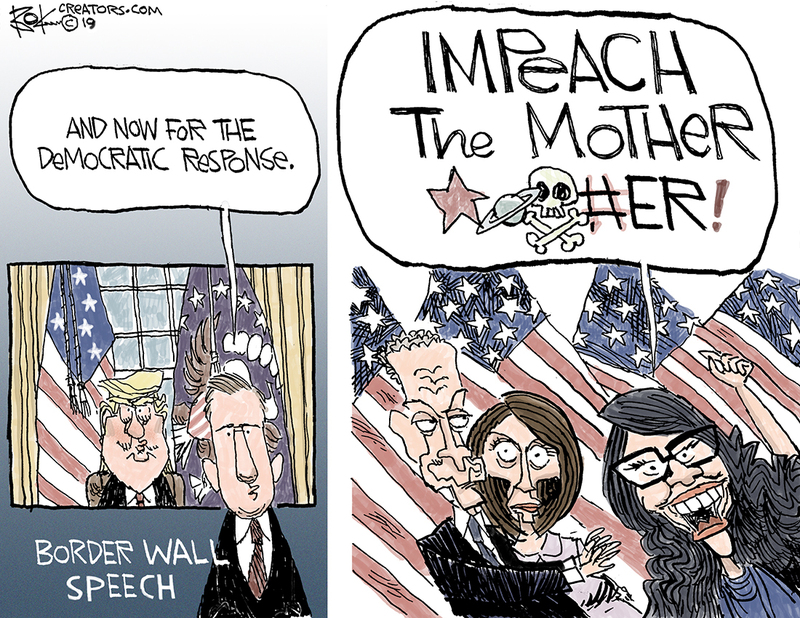 I never expected President Trump’s speech to have the new Democratic congresswomen high fiving and chanting “U.S.A., U.S.A.” But he did. The president brought the ladies in white to their feet by proclaiming there are more women in Congress now than ever before. (He didn’t mention that they’re Democrats.) Then they quickly sat down when he promised to build the wall. But back up when he announced plans for paid family leave. And back down again when he slammed late term abortion. Nancy Pelosi seemed to conduct the State of the Union performance from her perch behind Trump. She showed boredom by reading from oversized sheets of paper while he spoke. And when he blasted political investigations she frowned at the back of his head. She also tamped down outbursts from the Democratic congresswomen. And when it was time to stand up and cheer she inscrutably clapped her hands like a seal. Click Nancy to enlarge image. Pelosi’s a pro at politics. Trump, not so much. 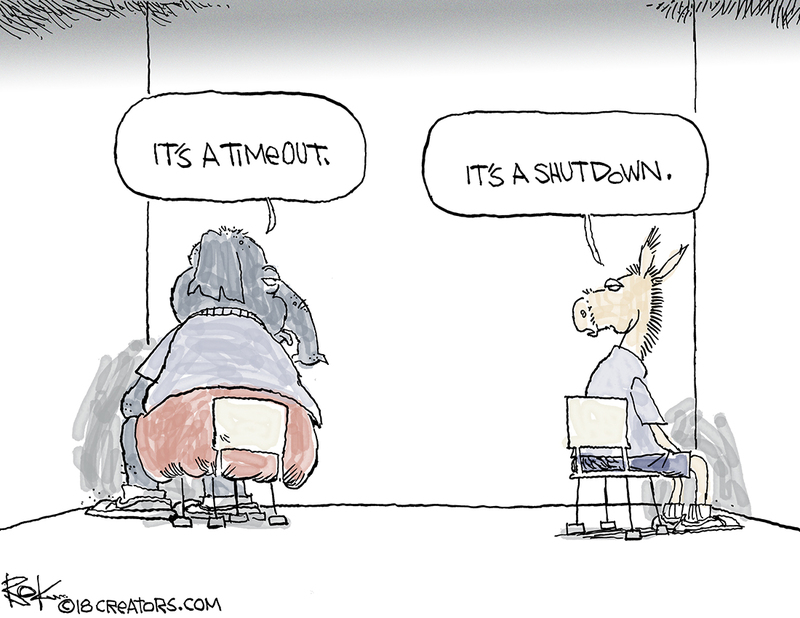 He ended the government shutdown for 3 weeks and got nothing in return but a promise to negotiate a wall Democrats don’t want and have no incentive to build. 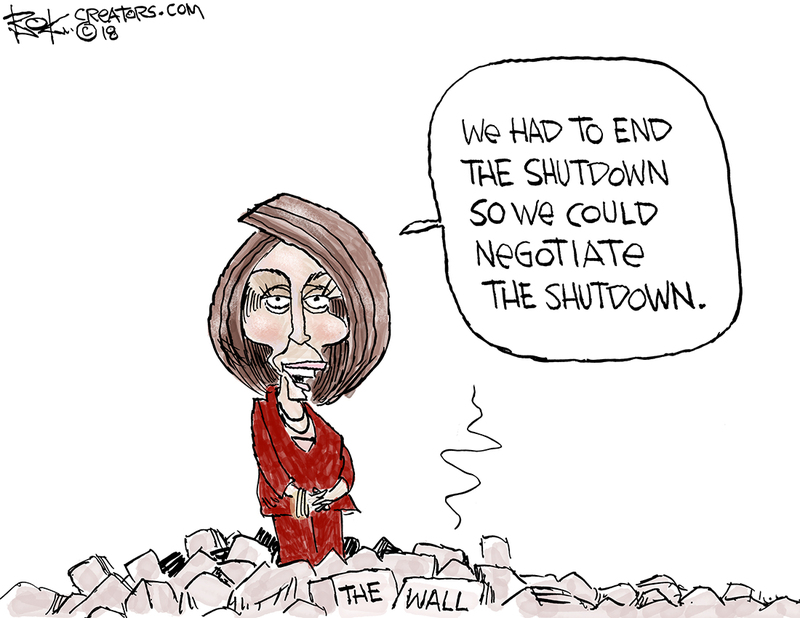 President Trump offered to take the blame for the shutdown and Nancy was glad to give it to him. Hard. His base is bummed. Trump offered relief for young immigrant “Dreamers” in exchange for for his wall. 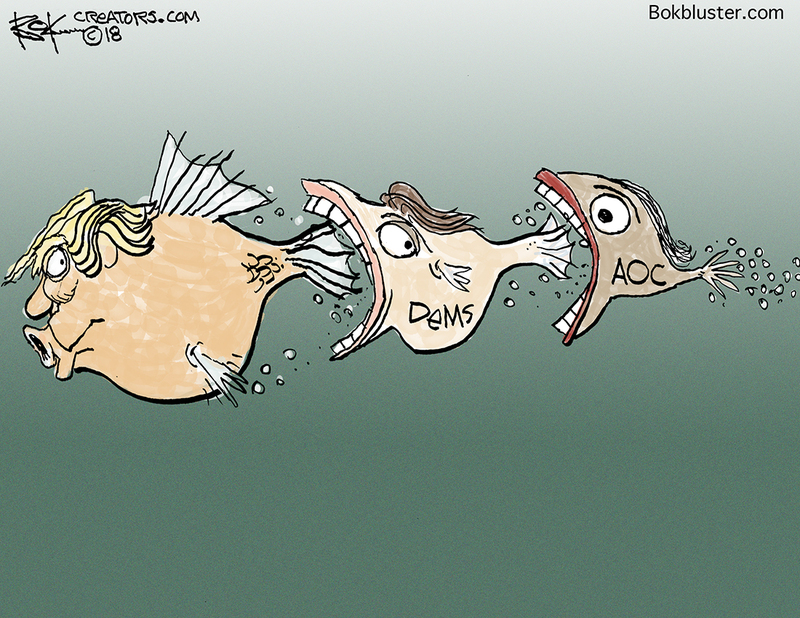 It was an appeal to the Democrat’s base but Pelosi wouldn’t bite. She wants Trump stuffed and mounted, if not devoured. Meanwhile, Alexandria Ocasio Cortez has bigger fish to fry. She says climate change will kill us all in 12 years, so why are you worried about money. Establishment Democrats seem more worried about her. President Trump’s speech from the oval office was short and sweet. He demanded five and a half billion for a border wall, or barrier, or something sticking out of the ground, but didn’t declare a national emergency. Marc Theissen thought it was great. Trump reached out to Americans beyond his base. But Chuck and Nancy thought otherwise. 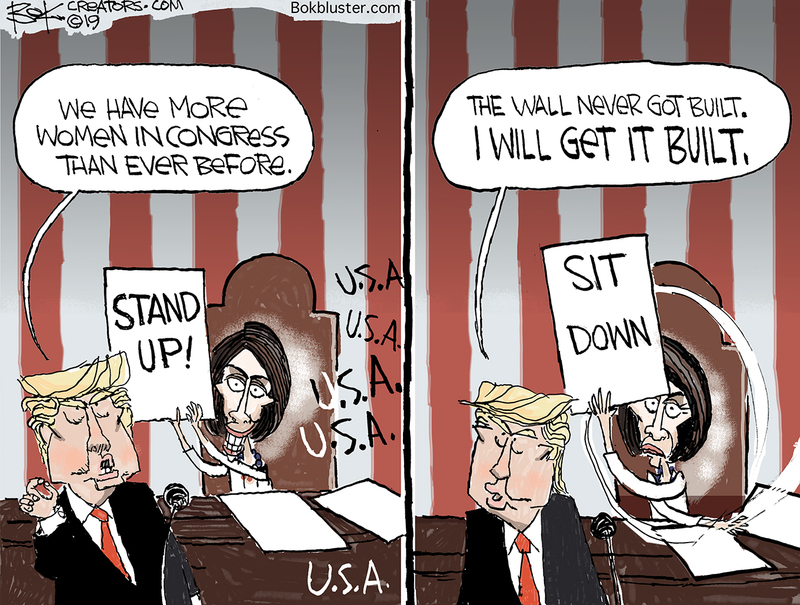 Nancy says the wall is immoral. Chuck said Trump used the oval office to manufacture a crisis. And they both looked stiff and uncomfortable. Could be they were looking to reach beyond their base too. Trump says $5.6 billion isn’t much for border security. But no money for a wall. They’re meeting this afternoon in the situation room.